Tales from a Tokyo Kitchen | Exploring the world of Japanese food, one bowl of miso soup at a time. Barring some exceptions, my general policy when I am being served food by someone else is to shut up and try to eat what is put in front of me. When I began eating meat again I developed this particular policy because I had grown really tired during my eight years of vegetarianism of having to discuss my dietary restrictions when someone was treating me to a meal, whether it was at their home or at a restaurant. These days, unless I’m being served something like ikizukuri that truly offends me in some way, I try to encounter it when an open mind and a (somewhat) adventurous palate. Not wanting to seem like the stereotypical picky American, I always adhere particularly closely to this principle when visiting my in-laws. Happily, they’ve never steered me wrong yet when it comes to food. Thanks to my husband’s mother I’ve tried some unfamiliar things that were much better than I had expected (raw horse meat, pickled octopus) and some things that were astoundingly good (soup made with the head of a sea bream, simmered shark meat). My most recent discovery is a dish called jūnen mochi. My husband’s family makes mochi every year from the rice they grow, and when we visited a few weeks ago we were lucky enough to watch mochi-making and get to enjoy mochi that had been freshly pounded only moments before. These days they use a special machine (which can also knead bread or pizza dough) instead of making it by hand. As the owner of a blog focused on Japanese food you would think this might inspire me to take pictures, but somehow I got so involved in the rush to eat the mochi while it was still soft and piping-hot that I entirely forgot to take any photographs of the process. Oops! A variety of other intriguing preparations were taking place as the rice was being steamed and pounded by the machine. First my mother-in-law brought out a bag of tiny gray seeds that she had picked somewhere on their property. After dry-roasting them, she handed them to my father-in-law who spent a great deal of time grinding them into a fine paste in a truly gigantic suribachi mortar. Sugar and soy sauce were added to the paste, and then pieces of mochi were quickly dipped into the suribachi before being served to the hordes of hungry grandchildren who promptly licked off all the paste before demanding more. After trying it myself, I could understand how they felt although I forced myself to eat the entire thing before asking for seconds. To tell you the truth, had I encountered this dessert anywhere other than at the home of my in-laws I might have avoided it. Jūnen (also called egoma) is the seed of a type of shiso (perilla) plant. I wish I could say I liked shiso, but except for rare exceptions the taste of this particular plant honestly turns my stomach. So had I known that egoma was a type of shiso, I would likely have never eaten it and sadly never known the particular joys of a piece of mochi slathered with sweetened egoma paste. Several weeks after returning to Tokyo I was still thinking about this dish. Unfortunately, my research online indicated that jūnen mochi is a specialty in some of the prefectures that are located north of Tokyo but is fairly rare in most other places. I combed my local supermarkets for egoma but wasn’t able to find it anywhere, and had nearly given up when I happened across it at Tomizawa, a baking store inside the Keio Department Store in Shinjuku. By the way, “jūnen” means “ten years” and apparently people used to say that eating this dish would add ten years to your life. According to my husband, for some reason it’s common in his home prefecture of Fukushima to drop the final “n” and pronounce it “jūne mochi.” But no matter what you call it, egoma paste is a unique flavor that somewhat resembles sesame but is a great deal more complex and fragrant. I did debate whether or not I should post this recipe here. If I had such a hard time finding egoma in Tokyo, it seems even more unlikely that anyone outside of Japan could get a hold of it. 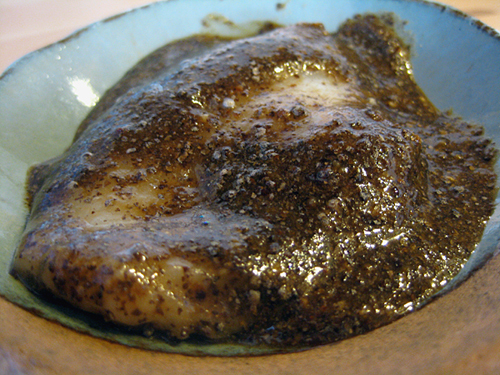 But although the particular flavor of egoma is what makes jūnen mochi so delicious, it would be just as good made with black sesame seeds (although according to the Japan Perilla Society egoma oil contains a great deal more alpha-Linolenic acid than sesame oil) so those would be a perfectly acceptable substitute. But despite the health benefits, unlike some savory mochi preparations which make decent afternoon snacks, jūnen mochi is extremely sweet and should be eaten in moderation to avoid a sugar crash. For this recipe I used unbleached cane sugar, but in the future I plan to give it a try with maybe honey or barley malt syrup. Not the world’s prettiest dessert, but still delicious! 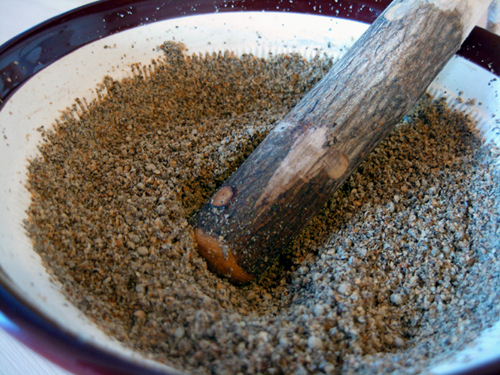 Dry roast the egoma seeds, swirling the pan to avoid burning them. When they become fragrant and are starting to pop, remove from the heat. 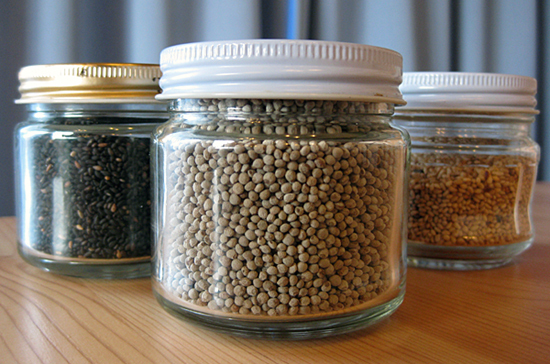 While the seeds are still warm, grind them in a suribachi or food processor. Add the sugar and soy sauce to the mixture in the suribachi (if you are using a food processor, stir them in by hand). The paste should be quite runny – if it is too thick, add hot water a teaspoon at a time until it is runny enough to adhere to the mochi. Cook the mochi until soft. An easy way to do this is to sprinkle it with a generous amount of water, cover with a wet paper towel, and microwave until soft. Dip the softened mochi into the egoma paste to cover. Serve. In Japan it’s practically required to buy souvenirs for people whenever you venture even slightly far afield. Since most Japanese people travel somewhere over the New Year holidays, the following week in a Japanese office is a veritable paradise of edible goods from across the country, all of which are conveniently wrapped in individual packages and distributed according to hazy rules of obligation. I work at home now, but when I was at my old company the period immediately after New Year always made me think of that Seinfeld episode where Elaine gets used to having treats at work and a blood sugar drop inspires her to sneak into her boss’s office and unknowingly eat a piece of cake from the wedding of King Edward VIII. 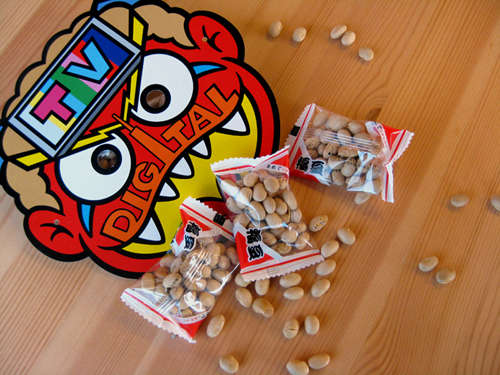 It is all too easy to expect a bite of something sweet in the afternoon, especially when your desk is full of random treats from across the country. When people travel, they particularly like to enjoy and buy “meisanbutsu,” which basically means (usually edible) items that a certain area is famous for. Some of these are obvious and known to everybody, like gyōza dumplings in Utsunomiya, apples in Aomori, and kishimen noodles in Nagoya. Some are a bit more arcane like the fantastic koppa mochi (mochi made with sweet potato) my friend Maya passed to me recently that a friend of hers bought in Kumamoto. Of course there are regional foods in America as well (my personal favorite being the mini doughnuts served at the Minnesota State Fair), but just like regional dialects the differences in Japan are far more pronounced probably because they’ve had much longer for these differences to develop. I find meisanbutsu to be quite fascinating, so I thought it would be interesting to introduce some of them as I happen to encounter them. To start this series, here are two types of souvenirs I’ve had in my kitchen lately. One of the most famous items in my husband’s hometown in Fukushima Prefecture is Mamador, which are tiny cakes that are roughly oval shaped and have a sweet filling. They taste sort of bland and have a truly horrible commercial jingle that goes “Miruku tappuri mama no aji” (“Made with plenty of milk…tastes just like mother”), so rather than giving my money to Mamador I prefer to buy Yubeshi from Kannoya (pictured above) for my friends instead. 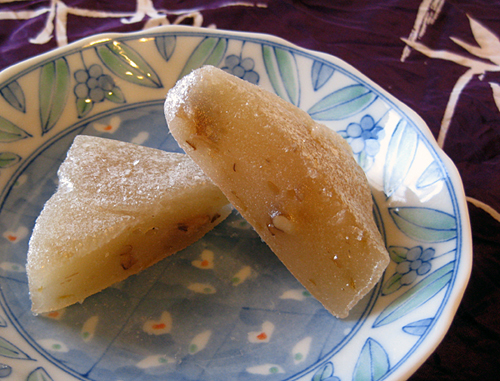 Yubeshi are Japanese-style sweets made from rice flour, sugar, walnuts, and a hint of soy sauce. They’re covered with a kind of sparkly, crackly starch. This year I was very happy to find that the winter version contained pieces of my beloved yuzu fruit in addition to the crunchy walnuts. As for how many of these I gave away and how many I ate myself, I’ll just leave that up to your imagination. A friend who recently moved to Niigata brought us some Sasa dango, which are rice flour dumplings filled with sweet bean paste and wrapped in bamboo grass leaves. The dumplings are flavored with yomogi (mugwort) which lends them their characteristically green color, and the bamboo grass imparts a certain aroma that is rather hard to describe. I really like the combination of yomogi and bean paste and enjoyed eating one of these with a cup of strong green tea. This nabe was inspired by Otona no Shūmatsu, which my husband Tsuyoshi reads every month. The title means “Adult Weekend” but don’t misinterpret it as the type of publication that’s sold in plastic sleeves at the convenience store – it’s actually a magazine about “gurume” (food and dining) with a heavy focus on seasonal foods and restaurants in Tokyo. The February issue contained a picture of an oyster nabe from some restaurant made with yuzu fruit. Given my obsessive love of yuzu, this immediately struck us as a fantastic idea and we set out to create our own version without the oysters, although I’m sure the oysters would be a good addition for people who like them (I tend to prefer nabe without shellfish, which makes everything else taste like shellfish). Unlike the nabe recipes I’ve already posted, this nabe does not involve simmering different ingredients for a long period of time. Instead, the individual ingredients are dipped into the broth and cooked likely shabu-shabu style, which allows you to enjoy the unique flavors of each type of vegetable with only a slight touch of seasoning. The broth isn’t very heavily flavored so using high quality dashi is very important, and since we made it stronger than usual I included it in the recipe here. We added tōmyō (pea sprouts) because they were on sale, but as always you can substitute as needed with whatever vegetables are fresh and available in your area. 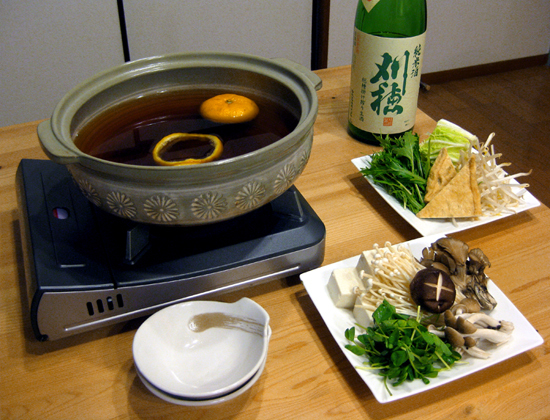 Sake is optional but is always a nice accompaniment to nabe! Make the dashi. Heat the konbu in the water until just before boiling, and then remove from heat. Add the fish flakes and/or niboshi and let sit for about five minutes. Strain. Wash the yuzu well and cut them in half. Squeeze and strain the juice. Use a spoon to remove any pulp or pith remaining in the yuzu halves and reserve to float in the broth (if you are feeling particularly fancy you might want to throw the used halves away and cut slices from a fresh yuzu). 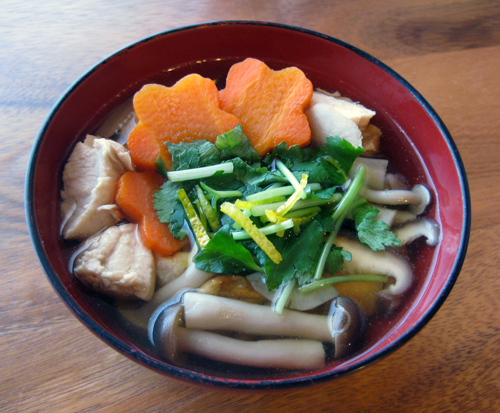 Wash and cut the vegetables and tofu into a convenient size for dipping and arrange on plates. 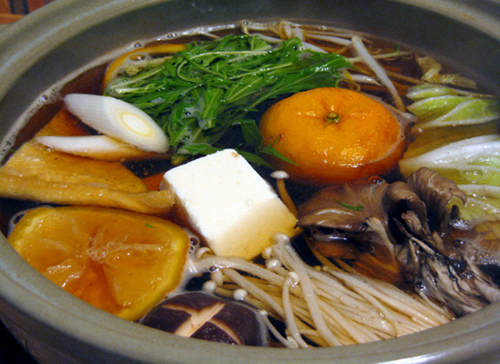 Add 1.5 liters of the dashi, yuzu juice, soy sauce, sake, salt, and yuzu skins to the nabe. Place on a portable burner at the table or the stove and cook over medium heat until boiling. Turn the heat down to a gentle simmer and allow each guest to dip and cook the ingredients of their choosing. The thinly sliced pork should be swished through the broth until fully cooked, but the vegetables only need to be lightly cooked until soft before being eaten. Use the condiments suggested above if desired. Finish the meal by adding the udon noodles to the broth. Be careful to remove and eat them before they become overcooked and too soft. Some Japanese foods are more difficult for foreigners to eat than others. The ones that immediately spring to mind are nattō and various unfamiliar sea creatures like sea urchin or fish eggs or teeny tiny squid. But there are also certain Japanese foods that have almost universal appeal; I’ve never heard anyone protest being served curry rice or tempura and I’ve never met anyone who actively dislikes miso soup. In particular, one food that is often eaten during the winter and that seems to appeal to most people is mochi, a type of pounded rice cake made from mochigome (glutinous rice). After all, who doesn’t like the taste of rice? Many people translate “mochi” as “sweet rice cakes,” but that’s a bit misleading because most mochi isn’t actually sweetened. To make mochi, glutinous rice is steamed and pounded into a paste and then dried until hard. At that point it can be grilled, microwaved, put in soup, or prepared in a number of other ways. Mochi is often enjoyed in the middle of winter, and even now there are events where people take turns at the long and difficult task of pounding the rice in a mortar until it is a viscous paste (mochi tsuki), but most people buy their mochi at the store. Many temples also toss mochi to spectators as part of various rituals (this is called “mochi maki” or “mochi nage”). Mochi can be square or round, made of white or brown rice, plain or flavored with flecks of green nori seaweed, stuffed with anko (sweetened red bean paste), or cut into paper-thin sheets. The simplest way to eat it is to grill it over a burner or under the broiler until it is puffed up, then dip it in a bit of soy sauce and wrap it in a piece of nori. Mochi can also be put into any kind of soup or hot pot dish, and I’ve even had it served in ramen. Dango (dumplings) made from mochiko (mochi flour) are also covered with savory or sweet sauces – I fell in love with dango smeared with sweet bean paste during my first year in Japan, and I ate so many that I don’t think I’ll ever need to eat one again. Mochi has especially deep connections with the Japanese New Year celebrations, when people display “kagami mochi” (literally “mirror mochi”) which are big round rice cakes that are decorated with ceremonial objects. After the celebrations are over the mochi are broken apart (called “kagami biraki,” or “opening the mirror”) and eaten. In the past, people displayed large handmade mochi on a wooden stand called a sanpō (note to Japanese language students: this word will never appear on any vocabulary quiz) and decorated them with real fruit and other objects. Nowadays most people buy small kagami mochi wrapped in plastic at the grocery store, many of which come with a convenient paper stand to display them on and plastic decorations that can be thrown away after opening the mochi. 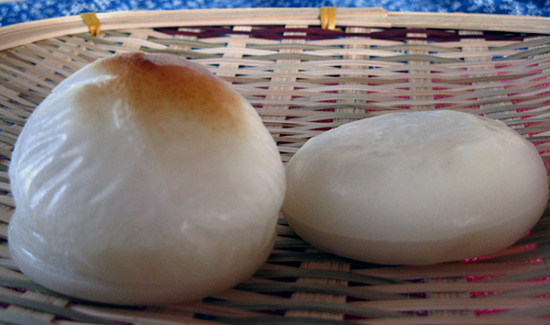 Rather than religious events and celebrations, outside of Japan mochi is usually associated with dessert and often served with ice cream, frozen yogurt, crepes, and other similar foods. In Japan as well mochi stuffed with ice cream is a common thing to see both at convenience stores and cute little cafes, and round mochi balls are a favorite item atop elaborate parfaits. One of my favorite ways to eat mochi is in ozōni, the soup that is traditionally served on New Year’s morning. But since over a month has already passed since the New Year, here are a few other ways to enjoy mochi. Kimchi (called kimuchi in Japanese) is a type of fermented Korean pickle usually made with Chinese cabbage that also contains a great deal of red pepper. In spite of the fact that traditional Japanese food involves few really spicy flavors, Japanese people love kimchi and I’ve ever heard that it’s consumed more than any other pickle. My Korean friends have told me that the kimchi sold in Japan is nothing more than a weak imitation of the real thing, and if you can get a hold of kimchi made by a real Korean person (or at least sold in a Korean grocery store) it is usually less sour and a great deal tastier than the Japanese brands. I love kimchi but I don’t buy it very frequently because although I try to eat a lot of fermented foods I am generally way of the extremely high sodium content. Like most things it should be eaten in moderation, and I consider dishes that contain lots of kimchi (like this nabe) to be an occasional treat. It’s a bit heartier than some other types of nabe, so you might want to serve it on a day when everybody is really hungry (we made it for a single friend who doesn’t cook for himself and was in dire need of an actual meal). This recipe contains Korean kimchi as well as Chinese hot bean sauce (called “tōbanjan” in Japan and “dou-ban-jiang” in China) and shūmai (pork dumplings), while the overall flavors have been adjusted to a Japanese palette. We also added some ground red pepper that had been given to us by a Korean coworker, which packs a realpunch and should be used carefully but is really good for warming you up! Heat sesame oil in the nabe. Add onion, garlic, ginger, kimchi, and tōbanjan, stir-frying until fragrant. Before the garlic and other ingredients begin to brown, add the meat and stir-fry. Once the meat is fully cooked, add the dashi. Simmer while removing any aku (scum or froth) that drifts to the top. Season the broth: add salt, pepper, sake, sugar, soy sauce, and ground red pepper, tasting and adjusting as needed. Add tofu, mushrooms, and Chinese cabbage, cooking until softened. Add shūmai dumplings, mizuna, and bean sprouts, arranging them in an attractive way (mounding the greens in the center at the end is an easy way to ensure they aren’t overcooked before serving). Drizzle hot chili oil (or regular sesame oil) over the nabe for fragrance. Serve on a portable burner at the table or ladle into individual dishes from the stove top, adding more dashi and vegetables as necessary. 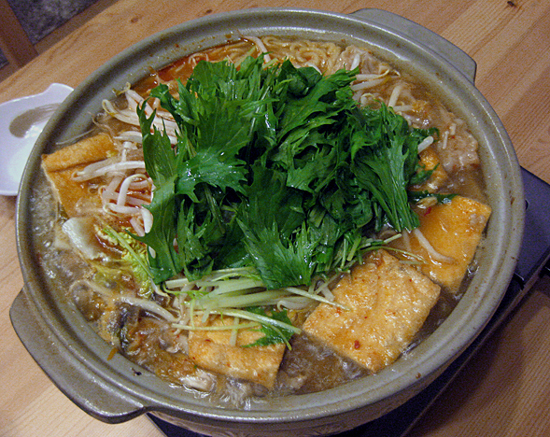 When the vegetables and other ingredients are mostly gone, cook the noodles separately in another pot and add them to the nabe, simmering for a moment or two to allow the noodles to absorb flavor (be careful not to overcook them). If desired, stir in two beaten eggs before serving noodles in the leftover broth. Unlike other types of sushi rolls, ehōmaki are not cut into bite-sized pieces before they are eaten. Instead, you are supposed to stand facing this year’s lucky direction and eat the entire roll without speaking. This supposedly brings good luck of all sorts. My former boss was really into this sort of custom so each year he bought ehōmaki and we all lined up in the conference room, facing the same direction and silently eating our sushi rolls. This was always vaguely awkward for me because I eat so slowly, but it was an interesting way to take a break from work. Like so many other foods in modern Japan, people rarely make ehōmaki at home anymore and most people buy theirs either from a specialty shop or convenience store. Since eating convenience store sushi always makes me feel somewhat ill due to the massive amounts of MSG and since it’s been a while since I rolled sushi, I decided this year to try making my own ehōmaki for the first time. It seems that there are some ingredients which are considered particularly lucky for ehōmaki, but my husband and I decided on a simple combination of cucumber, egg, and braised shiitake mushrooms with kanpyō (dried gourd strips). 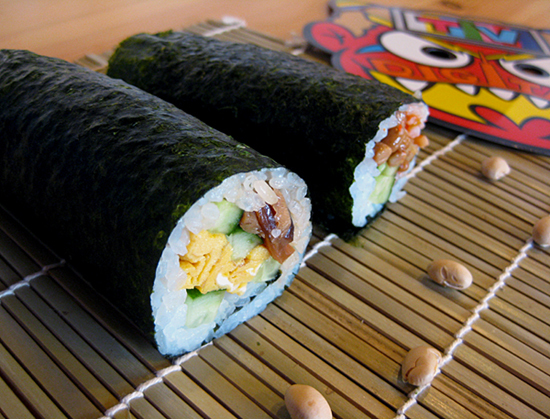 We had some extra rice left so we also made a roll with some leftover nattō (fermented soybeans) and kimchi. Most ehōmaki also contain sakura denbu, which is made of shredded fish flakes that have been dyed a lurid shade of pink. It’s not my favorite so I left them out. Here are some links that might be of use if you’re considering making ehōmaki this year. Even if you eat yours sitting at a table, I think that a delicious sushi roll is always a good way to bring a little luck into a gray February day! Ozōni is a soup that is served on New Year’s morning in Japan. In Japanese “ozōni” is written with the characters for “complex” (雑) and “simmer” (煮), which is a roundabout way of saying that this soup can contain a wide variety of ingredients. 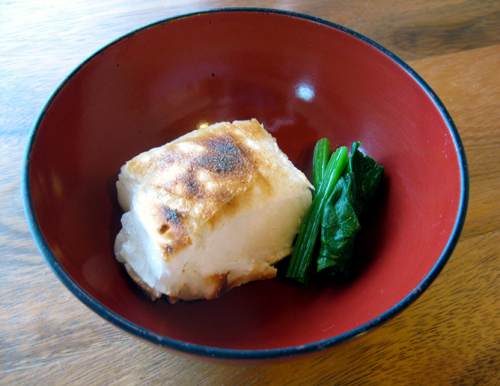 Grilled mochi (rice cakes) are almost always included, along with vegetables such as carrots, mitsuba (trefoil), or spinach. For a little extra holiday cheer, some people also include pieces of colored wheat gluten in auspicious shapes like ginkgo leaves. Tiny pieces of yuzu skin can also add an aromatic garnish. But like most Japanese foods, ozōni is subject to a tremendous and perplexing range of regional differences. Depending on where a family is from, the broth of ozōni might be based on soy sauce, miso, or something else. Chicken or other meats might be incorporated either as slices or small meatballs. I’m sure there are probably whole books out there about different types of ozōni, but really the only constant is that it is served as breakfast on the first morning of the New Year. In that way ozōni is sort of like Japan’s equivalent of Thanksgiving stuffing – everyone has their own way to make it and everyone is convinced their way is best. This recipe is mostly based on the ozōni that my husband’s mother makes, which is flavored only with soy sauce and sake and depends on the addition of chicken breast and burdock root to add depth to the broth. I’m not usually the type of person who bothers cutting vegetables into decorative shapes, but I did drag out the special tool to cut the carrot into the shape of plum blossoms in honor of the New Year (except I realized halfway that my tool is shaped like a cherry blossom, not a plum blossom – oops). Here’s a video if you want to try making the carrots fancy. This recipe is even prettier if made with a combination of regular carrots and kyōninjin carrots from Kyoto, which are a deep red color and are available in Japan towards the end of the year. Yuzu skin, cut into small “needles” or slivers. Cut the mushrooms into bite sized pieces. Use the back of a knife to scrape the skin from the burdock root, then cut by “shaving” off small pieces (sort of like sharpening a pencil by hand). Cut the carrots into decorative shapes or simply chop into circles, about three pieces per person. Cut the chicken breast into bite sized pieces and add to the dashi. Simmer until cooked all the way through, removing any aku (scum) or fat that floats to the top. 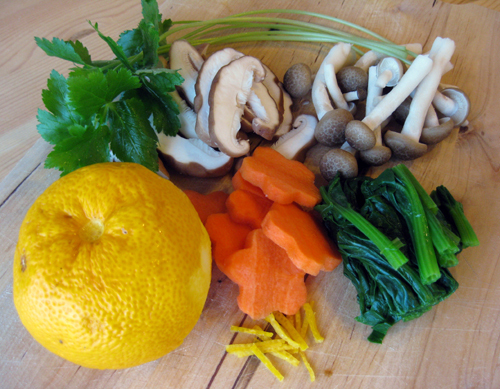 Add the mushrooms, carrots, and burdock root to the dashi and chicken. Continue simmering. Season with soy sauce and sake. Taste, and adjust seasonings as necessary. Blanch the spinach in a separate pot, then rinse. Chop and form into neat little bundles. Grill the mochi according to the directions under the broiler or atop the stove. Place a bundle of spinach and piece of grilled mochi in each bowl. Use chopsticks to arrange carrots and other ingredients in bowls, then pour broth on top. Garnish with chopped mitsuba and yuzu skin.